Liverpool striker Dominic Solanke is reportedly close to sealing a short-term loan to Crystal Palace after snubbing advances from Brighton & Hove Albion. The England international has endured a difficult campaign with the Reds where he has failed to earn a single minute of gametime and he appears set to leave on a temporary deal when the transfer window reopens. Amidst this, Palace and Brighton have both been linked with the ex-Chelsea graduate but according to The Mirror, the former are understood to have won the race for the highly-rated forward. 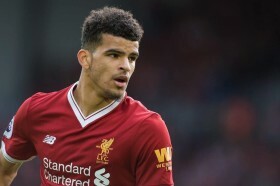 It is added that Roy Hodgson's tendency to play with a two-striker combination unlike the one upfront at Brighton has influenced Solanke's transfer decision ahead of the New Year. Liverpool continued their merry ways at the top of the standings after they secured a comfortable 5-1 triumph over Arsenal at Anfield on Saturday evening. The victory sees them holding an eight-point lead at the top of the standings, although that deficit could be reduced to six, should Manchester City come up triumphs at Southampton tomorrow.